Yet, somehow, the eccentric performance artist new baroque folk troubadour Sufjan Stevens and his gonzo banjo, xylophone and tromboned band’s Christmas boxed set nearly moves me to tears. Well, okay, with frazzled nerves and heavy heart this time of year—good news amidst such a needy world—it does move me to tears. Thanks for supporting our odd little shop, and caring for our reviews and annotations here at BookNotes. Special thanks to those that subscribe, folks who have shared the blog with others, fellow book lovers who have posted comments, our mail order customers, local friends, good staff and all our loved ones. And the ones nobody loves. Merry, merry Christmas. This cut becomes rowdy, and, yes, strangely moving. (I don’t know who made the video.) What is your favorite line? (“Hijack the snowplow”?) Is there any other Christmas song that mentions K-mart, the tower of Babel, and “your sisters new bangs, she cut them herself”?) Come on, Let’s Boogie to the Elf Dance. Here, he does a low-fi, home-made version of Joy to the World. When the voice goes unusually up just a bit on the word “king” I get tingles. The quiet falsetto fade out reminds me of some nearly eerie homesick thing; Christ comes to dwell here, home, indeed. And, on the same album, this quiet version of Holy Holy Holy. A lovely holiday video, too. As we celebrate the baby Jesus, it should be a large reminder of the “blessed Trinity.” If you are ambitious, listen to his stunning version of Come Thou Font of Every Blessing; it will make you weak in the knees. Now, that’s how to have a merry Christmas. Have you heard AnaÃ¯s Mitchell’s song, “Song of the Magi?” If not it’s worth a listen. ooh, i really wanna hear this. Say, does anybody like Martha’s Troubles? They have a Christmas EP, a short CD, that I adore. I’m in between our 2 services here, and just wanted to wish you and your family a wonderful Christmas of joy and laughter, of stories and music, and memories. We made a new memory tonight. Kaylea and Sophie both sang with me on Away in a Manger…! Yes! 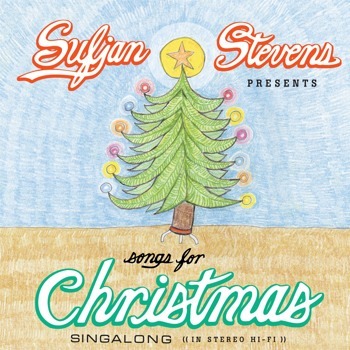 Sufjan Stevens sang through Advent/Chrismas at our house for a second year and we look to him returning in 2009. Good stuff. I want to stop by tonight. I’ll aim to make it before you guys close.